3.6.14-beta is now available and it has clipping! To use clipping, create a clipping attachment which has a polygon similar to a bounding box attachment and an "end slot". All attachments between the clipping attachment's slot and the end slot are clipped by the clipping polygon. When it comes to computer graphics, there are a few clipping techniques with various pros and cons. For Spine we used a CPU clipping approach because it has the best compatibility with game toolkits. 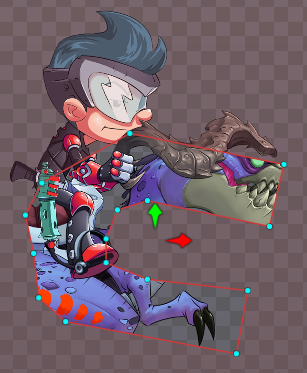 This ensures clipping works in every game toolkit exactly like it does in the Spine editor. Other approaches using shaders either aren't possible in many game toolkits, or can cause conflicts with other shaders an app may want to use. Keep in mind that clipping comes with a CPU cost. Using complex, concave clipping polygons increases the work that needs to be done. Also, the more triangles you are clipping (ie, complex or many meshes), the more work that needs to be done. If you are exporting images or video from Spine or making a desktop game, clipping performance is unlikely to be important. However, if you are making a mobile app, you will want to keep an eye on CPU usage when using clipping. There are two additional caveats: 1) Only one clipping polygon can be active at a time, and 2) the clipping polygon must not self intersect, else clipping behavior may look strange. We continue to work on clipping and other version 3.6 features, but we are happy that you can now try it out for yourselves.